Warning: this article includes spoilers for Doctor Strange, the mid- and end credits scenes and its sequel too. So, yeah, avert your eyes if you're not into spoilers. Doctor Strange is now out in UK cinemas. Normally this would mean the rest of the world has to steer clear of the interwebs for fear of accidentally reading something they don't want to. But, as it turns out, we already knew one of the movie's biggest reveals a couple of weeks back. But wait, isn't Mordo supposed to be the good guy? Kinda. He plays the doting best pal and confidante of the Doc throughout the film. In the final credits scene, we're shown his true colours as he disarms Benjamin Bratt's character of his powers in a brutal way. "There's too many sorcerers," Mordo mutters while doing so. So if that didn't convince you that he'd gone proper darkside, Derrickson's recent admission confirms it. There you have it, folks. Mordo's evil and we'll likely see the full extent of that in Doctor Strange 2. 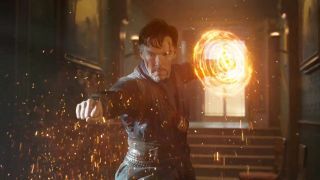 Directed by Scott Derrickson and starring Benedict Cumberbatch, Chiwetel Ejiofor, Tilda Swinton, Rachel McAdams, Michael Stuhlbarg and Mads Mikkelsen, Doctor Strange is in UK theaters now and opens in US theatres on November 4, 2016.